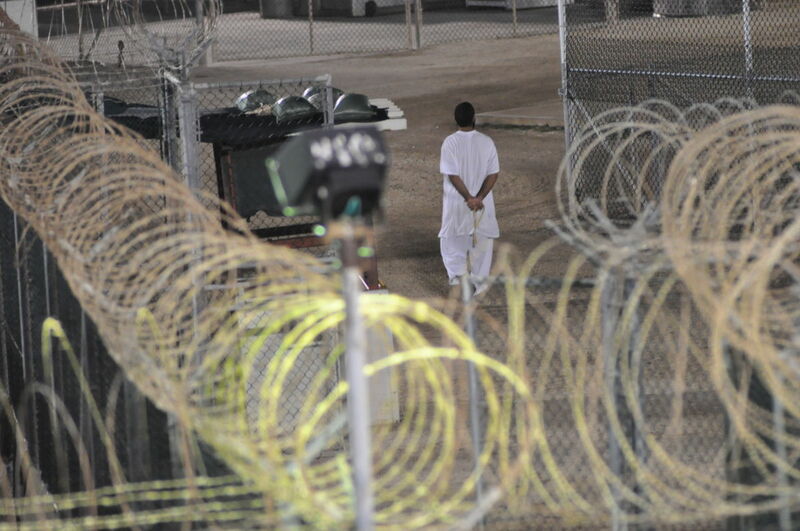 Canadian detainee Omar Khadr walks the grounds of Camp 4 in Guantanamo Bay praying before dawn in this Nov. 4, 2009, photo. On December 21, Canadian Justice June Ross denied former Guantánamo prisoner and Canadian citizen Omar Khadr his request to have his bail conditions loosened. Under the current terms, Khadr can travel within Canada, though he has to let his bail supervisor know, and cannot travel out of the country. Additionally, Khadr cannot have unsupervised calls with his sister who lives in Georgia. In response to Khadr’s request, Judge Ross stated that, “The passage of another year has changed neither Mr. Khadr’s legal status nor my view of the law…. The evidence does not indicate a current hardship arising from bail conditions.” Though Judge Ross also added that her decision is not “etched in stone” and could be reconsidered in the future, one thing is clear: Khadr’s Guantánamo nightmare will continue. The decision regarding Khadr’s bail was contingent in part on the appeal of five war crimes convictions while he was in Guantánamo that include murder, attempted murder, conspiracy, material support for terrorism and spying. These alleged crimes, however, were adjudicated by military commissions — which many have criticized as a faux form of justice (among other reasons) because coerced confessions are considered acceptable evidence. Khadr was captured in Afghanistan in 2002, where he allegedly killed a US soldier – himself being seriously injured in the battle in which he was embroiled. Though he was only 15, he was subsequently detained by the United States and was sent to Bagram Air Base and then Guantánamo — both places where he was subjected to violence and torture. The torture he endured included sleep deprivation, being held in solitary confinement and being used as a human mop. This torture was integral to gaining his forced confession, resulting in the conviction of five war crimes. Khadr was the youngest prisoner to be held at Guantánamo and the only child to ever be charged with war crimes. However, unlike other youth embroiled in conflict, he has never been designated as a child soldier by the United States. Though Khadr’s designation as a child soldier might seem like water under the bridge at this point, it’s impossible to view the repeated hardships and legal gymnastics that he has to endure as stemming from anything other than this. This is precisely why the status of child soldier, denied to him, is impossible to ignore. Not only did the US government fail to give Khadr rehabilitative services as they would with other child soldiers, he has had to endure prolonged navigation of legal struggles rooted in the US’s violence. Moreover, Canada picked where the US left off with the violence towards Khadr, by initially failing to repatriate him, continuing his detention after Guantánamo and accepting his conviction by the United States without question. Thus, Khadr is a victim of two legal systems – both of which denied him the rights of a child. Had Khadr been considered a child soldier, his predicament would have looked a lot different. As Jo Becker from Human Rights Watch wrote when Khadr was first released on bail, “Whether ‘voluntarily’ or forcibly recruited, the use of child soldiers is now recognized as a serious human rights abuse, and when involving children under age 15, it’s a war crime.” In Khadr’s case the clear presumption is that his involvement was voluntary — erasing the notion of children’s inability to make “voluntary” decisions – at least in his case. Even if and when Khadr was recognized as a child, he was never recognized as a child soldier. Shelly Whitman of Roméo Dallaire Child Soldiers Initiative, an organization that works to implement preventative solutions to the use of child soldiers, stated, “One of the problems we have had is that people reference Omar Khadr as a ‘child terrorist’ not a child soldier.” One of the reasons for this seems squarely based on his religious identity – after all, Guantánamo Bay prison as it has been used in the “war on terror” has only housed a Muslim male population, and Khadr’s conviction as a child war criminal is unprecedented. Both of these facts are consistent with the larger structure and logic of the war on terror that is deeply embedded in Islamophobia – a system of oppression rooted in a construction of Muslims as inherently prone to violence, and specifically terrorism. Thus, Khadr, detained as a child, was never considered vulnerable and helpless as other child soldiers would have been, but instead just as culpable as his adult counterparts because of his Muslim identity. In Khadr’s case, the distinction between “child terrorist” and “child soldier” did nothing other than to solidify him as a criminal. And at the end of the day, even if Khadr’s treatment violated the law, the label “terrorist” served to obfuscate this fact and make his age irrelevant. In 2015, when Khadr was released on bail in Canada, he stated, “I will prove to them that I am more than what they thought of me.” What if the Canadian government had thought of him as a minor who was coerced onto the battlefield without agency to escape, rather than a terrorist who willingly fought alongside al-Qaeda? Like other children at the age of 15, Khadr would have been treated as a minor with rights according to international and domestic law. Moreover, while this recent bail decision may seem less consequential than others handed down to Khadr, what it reveals is that freedom from detention at Guantánamo hardly ends prisoners’ ordeals as they re-adjust to a new life with new conditions and the ever-present stigma of being labeled a terrorist — in Khadr’s case, living a staggered life and a stolen childhood. Furthermore, like other cases of resettlement and repatriation of Guantánamo prisoners, Khadr’s case highlights the pernicious role that the United States plays in adopting a gloves-off approach, even after the prisoner is no longer in US custody. In 2017, Khadr’s long-distance teacher was the subject of an article for her role in instructing him while he was languishing behind bars. Through her instruction, Khadr, an avid reader, had elected to read the memoir of Ishmael Beah, who was a child soldier in Sierra Leone. Such was the irony at Guantánamo: Khadr could read a book about a child soldier, while being denied this classification himself. Instead, he has been labeled a war criminal. If history ever sets the record straight, then Khadr will one day be recognized as a casualty of the war on terror that denied him his rights as a child soldier. Loosening Khadr’s bail conditions would have been one step toward this and could have rectified some of the injustice that he has faced. But unfortunately, justice is not often meant for Muslims, and as this case demonstrates, Khadr might well be waiting a long time before he truly knows what it means to live a life free of detention – whether behind actual bars or virtual ones. If and when this day comes, it might just set a precedent for all the Muslims who have been victimized by violence the US has committed in the war on terror. Dr. Maha Hilal has a Ph.D. in justice, law and society, and the focus of her research and expertise is on Muslim Americans’ responses in the context of national security post-9/11. She is the co-director of Justice for Muslims Collective and an organizer with Witness Against Torture. She has written and spoken extensively on the topic of institutionalized Islamophobia in the war on terror, with a focus on the Guantánamo Bay prison and torture. Using legal loopholes, the US continued to assist the South Sudanese government, which kept child soldiers.